Learning how to get signed by a record label is a very important thing. For every aspiring or upcoming artist in the Music Industry, perhaps the one thing that might give you a jet fuel for propelling to the skies is getting signed by a very big record label. Granted, you’re talented and can fare off well on your own, but a label takes care of the business music brings, handles your deals and bookings and leaves you ample time to concentrate on perfecting your acts in music. A label also gives you a legal covering in times of crisis that comes in the form of intellectual property theft, piracy or copyright. They stand for you or give you an attorney that can plead your cause. And of course you know that associating with the bigwigs overtime, makes you become like them, if you are not lazy. Music isn’t an exception, think of all the big names in the Music Industry, think of any upcoming music act rolling with one of these big names, pitching a tent under their label or imprint and then you can see a brighter light for that little star. This article will show you how to get signed by a record label that will give your music career a boost and pluck you out of obscurity. Even though we’ve touched on what a record label does at the introduction up there, let’s still get down to what a record label really is and then the guide will follow afterwards. A record label or company is a brand that is concerned with the business (productions, marketing, promotions) side of music that orbits the circle of a music artist. What this means is that, a record label transacts all the businesses associated with music for an artists signed under them like production of albums and singles and marketing of the same, promoting the works of the artists on any platform available, making connections for collaborations, fighting legal battles among others. This leaves the artist plenty of time to major on the music. And a huge plus here; a record label helps to project an upcoming artist to the world, using it’s already established fame, some grooming and collaborations. Basically, there are two ways on how to get signed by a record label, it’s either by making yourself visible and attracting the attention of these brands or you pitch them with your music via various platforms and get them to call you. These guides can help you achieve the purpose of this article either ways. If you have not been signed by any record label yet as a singer, then you’ve probably been reeling out incredibly dry songs. Take a break, explore places, associate with new environments, find love, get heartbroken, try out a new field of discipline, any of these can inspire you to pen down very enticing lyrics and make you a good song. Train your voice, learn some ropes on music and streamline your acts properly. No one signs a rookie who has no potentials of making it big in the Music Industry, you will not even sign yourself if you were in the shoes of the CEO of a record label. Most artists were just too good to be hidden and so these labels discovered them from even their rabbit hole hideout. Bottom line is “get fantastic in your line of duty”. If you do good songs, record labels will fight over you. Even though your songs might not be too good, but have very good lyrics and vocals, your potential record label might hinge on that and still sign you in with the intent of working on the sounds and instrumentals of your songs. You must have very good prospects before then can work on you and groom your acts properly. When attending functions, whether you are performing or not, get to fraternize with other music acts and producers. This increases your chances of building your network, which when built properly can fast track your access to record label CEO’s. One recommendation is all you need to get signed, which can come from one of your established networks, and of course, you are good already doing music, so that part of recommending a greenhorn in music is scrapped out. Socialize, build relationships and expand your networks and then you can be on your way to being a signee in one of the top record labels you crave for. Your visibility increases your accessibility, and makes the world know you actually exist. Go social on the media. Create a facebook, twitter and instagram accounts with your stage name as an artists. If you can, get a website, if you can’t get a website presence for your music career, it’s not so bad. Hinge on the social media and establish a global presence for your career. Get your songs on music sites in downloadable format. Distribute your songs in as many platforms as possible. Publicity is one of your invaluable tools to get extremely visible, never neglect it. One label owner might just be bored on a good day, finds your song online, and since he’s bored he might just be all “well let’s see what this one’s got”. That simple, you get a call or mail, and you are giving a chance to come show your worth at the expense of your talent. Record labels have what they call A&R agents. The role of these guys is to look out for fine music artists, made or upcoming, and get them signed into their host record label. They also help the artists in production and marketing. Regularly, they scout for artists with huge potentials and bring them into their fold and if you can find one of these A&R guys and probably lobby them, then you are half way to getting signed. But first the record labels collect demos from the A&R guys and check them out to know if the artist is worth the trouble, which takes us back to the first on the list. “Sing good songs”. Pitching is the act of sending mails to the label owners, informing them of your desire to become one of the music acts they manage. Apparently these labels receive tons of pitches daily, yours needs to stand out in order for it to be considered. So how do you go about this? first, you make a list of top record labels that piques your interest and the ones that you really want to be signed unto. After this, you sort out the ones that have a serious interest in the kind of music you do, so you don’t start pitching labels that major on hip-hop and reggae music, while you are a soul or R/B singer. That would amount to another pitch hitting their trash. So choose in line with the genre of music you do. Pitch as many as you can, and make your cover letter brief and lucid. Don’t bother writing it yourself, if you aren’t too expressive in writing. Get someone to handle that and make your pitch one of a kind. Don’t forget to add a link to download one of your best works in the studio. Get yourself a manager or an A&R that can run these business for you, pitching publishers and marketing you, while you invest time in racking your brains out for crackerjack music ideas to employ in your singles. This manager or A&R will once in a while critically evaluate your songs, look for a good producer to enhance the beats, criticize when necessary and give you a pat on the back when necessary too. 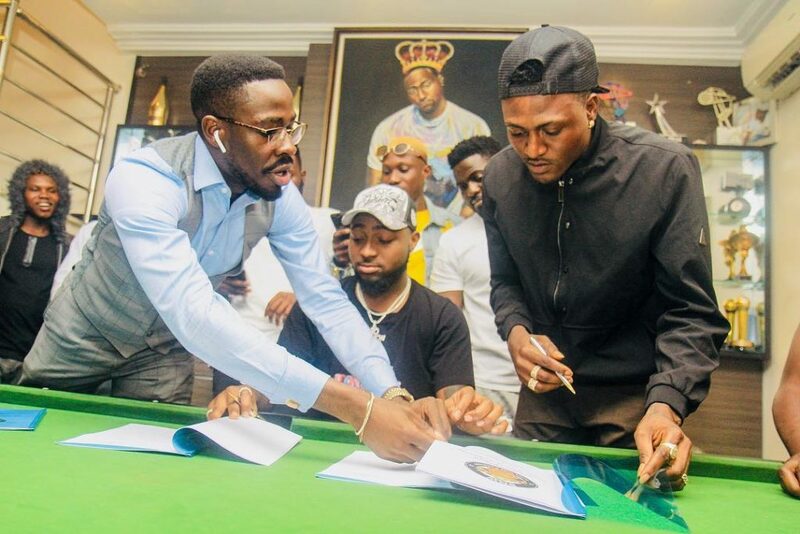 A Record Deal From YBNL, DMW OR Starboy Ent. Which One Are You Taking?? ?